From the critically acclaimed author of Beneath a Marble Sky and Beside a Burning Sea—the new novel from “a master storyteller,”* set in contemporary Asia. From John Shors comes an unforgettable story of redemption set in modern-day Vietnam. 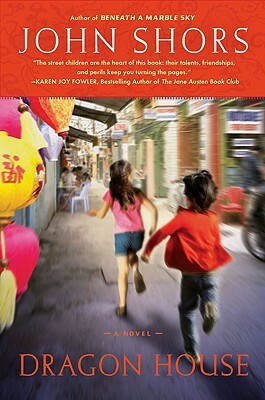 Dragon House tells the tale of Iris and Noah—two Americans who, as a way of healing their own painful pasts, open a center to house and educate Vietnamese street children. In the slums of a city that has known little but war for generations, Iris and Noah befriend children who dream of nothing more than of going to school, having a home, and being loved. Learning from the poorest of the poor, the most silent of the unheard, Iris and Noah find themselves reborn. Resounding with powerful themes of suffering, sacrifice, friendship, and love, Dragon House brings together East and West, war and peace, and celebrates the resilience of the human spirit. John Shors traveled extensively throughout Asia after graduating from Colorado College in 1991, living for several years in Japan, where he taught English, and then trekking across the continent, visiting ten countries and climbing the Himalayas. More recently, Mr. Shors worked as a newspaper reporter in his hometown, Des Moines, Iowa, before entering public relations and moving to Boulder, Colorado. Beneath a Marble Sky is his first novel. What compelled you to read Dragon House? What did you enjoy most about the novel? Were you aware that so many children around the world are homeless? Which character did you like the most? Why? Do you think John Shors tried to draw comparisons between the Vietnam War and the Iraq War? If so, why? If you have read John Shors' earlier novels (Beneath a Marble Sky and Beside a Burning Sea), how do you think he has changed as a writer, if at all? What did you think of Loc? Why do you think the author chose to make him a former street child? Could you tell that John Shors had traveled extensively in Vietnam? Do think it's important for writers to visit the places that they bring to life? The author talks a lot about "dragons" in his novel. What do you think dragons symbolize in the story? Did you enjoy Minh's character more when he was silent or when he spoke? Why? Would you like to read a sequel to Dragon House? If a sequel was written, what do you think would happen in it? What do you enjoy most about John Shors' writing style?